Lots of apps promise to make your life easier. But MPower Labs' BuddyGuard offers to actually save your life. BuddyGuard VIP provides a suite of services that aim to act as a safety net when you think you might be going into a dangerous situation. 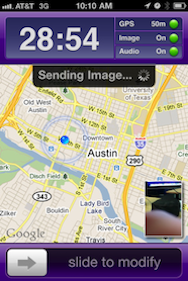 The app is designed to be launched and left running on your iPhone or iPod touch. An Instant Protection feature uploads audio and camera images from your device in real time to Internet servers, along with your GPS coordinates when activated, so the information you capture cannot be deleted if your iPhone falls into the wrong hands. You can set a check-in timer which requires you to provide an “all clear” back to BuddyGuard when you’re meeting someone after a set period of time; if you don’t check back in, BuddyGuard will raise alarms with your contacts as you specify. Or you can trigger an alarm yourself by sending BuddyGuard an SOS text message from any text-enabled phone. Finally, BuddyGuard uses your iPhone’s accelerometer to trigger an alert if you’re in a crash or a fall lasting more than one second. BuddyGuard itself is a free application and service, but for $120 a year, you can also sign up for emergency support services though MPower Labs’ affiliation with GEOS search and rescue. GEOS provides a communications center with 24-hour staffing in 150 languages, and direct connections to police and emergency services almost anywhere in the world. (The exceptions: Afghanistan, the Democratic Republic of the Congo, and North Korea.) Your annual fee includes access to the emergency response center, and a $1 million Lloyd’s of London insurance policy to pay for emergency services such as ambulances and evacuation. This may be overkill for the average blind date arranged over the Internet, but as they say, it couldn’t hurt. And perhaps it’s not overkill if your work takes you to dangerous parts of town—or the world. BuddyGuard requires any iOS device running iOS 4.0 or later; additional versions are in development for Android and Blackberry.